Val d’Isère, along with Tignes, is part of the Espace Killy ski area and each year hosts the Critérium de la Première Neige at the beginning of December. It is well known for its advanced ski areas, but Val d’Isère also provides for beginners. It is a stunning resort, boasting beautiful chalets that offer exceptional levels of service. Val d’Isère has expanded over more recent years and now the resort encompasses surround towns and villages. As you climb the mountain road these are La Daille, Le Crêt, Portillo, Val village itself, Richardes, Le Laisinant and finally Le Fornet, respectively. Le Joseray, La Legettaz and Le Chatelard are three lovely hamlets that lie above Val village and are accessed by a different road. All Val d’Isère towns and villages are linked up by a free shuttle bus service. La Daille is one of the newest parts of the Val d’Isère resort. It was constructed in the 1960’s is now a popular spot for self-catered accommodation and some very plush hotels which are close to the runs. La Daille hosted the first ever downhill race counting for the World Cup tour in 1969, and opened each tour until just a few years ago. The competition is now called Critérium de la Première Neige and is held in Val d’Isère itself. La Daille is served by the red bus line. Meaning The Crest, Le Crêt is one of the newer areas of Val d’Isère and mostly residential; consisting of private or upmarket catered chalets. The buildings are in keeping with traditional Savoyarde characteristics. Le Crêt is also served by the red bus line. Portillo is an extension of Val village - a walk-able distance and just one bus stop from the train station. Portillo is also served by the red bus line. Val village is the main hub of Val d’Isère, where you will find an abundance of shops, restaurants and bars. There is a learning area for small children here, as well as easy access to a long straight blue run, perfect for beginners. Val village can be accessed by all bus lines. Richardes does not have a ski lift in the village, but hop on the red bus line and you will arrive at either Val village or Le Laisinant in just one stop. About a 15 - 20 minute walk to Val village, Le Laisinant is a hamlet where your group can appreciate tranquility, but also access the bustle of Val village quite easily. It still has many old, traditional buildings and few new ones, so if it is culture you are looking for this is the village for you! With its own lift Le Laisinant gives easy access to the slopes. At the top are red runs that lead back down to the village, or a blue run that takes skiers down to La Fornet , where they can take the Fornet lift and do it all over again. Le Laisinant is also served by the red bus line. The furthest point of Val d’Isère is La Fornet. This is lovely village, with easy access to its very own glacier. This is a good spot on low visibility days with winding tree lined runs for all levels. La Fornet has access to one of the highest points in Val d’Isère via a system of lifts - The Fornet, The Valon, The Cascade and The Montet, which takes skiers 3100 metres. La Fornet is also served by the red bus line. These three hamlets give super easy access to the pistes, Le Joseray being the closest to the main gondola - Solaise. A bus service connects the three hamlets to Val village. La Fornet is served by the yellow bus line. Ski Val d’Isère: Lots of handy information and history about Val d’Isère. ESF Val d’Isère: Not only will our nearly 250 English speaking ski instructors make you a better skier or boarder, but we will also make your ski experience hassle free by acting as your mountain guide. Snocool: Snocool have been operating an excellent ski and snowboard school since 1998. Their services include private and group lessons, guiding and ski rental. Oxygene: Offering fun, friendly lessons for over 20 years. From child or adult group ski and snowboard lessons taught in English, French (and other languages besides), to private instruction and coaching, adrenaline-sparked activities, off-piste guiding and the very best in equipment hire and rental. New Generation: Running since 2004 New Gen have a strong reputation in resort. Always touted as a British Ski School, we now like to think of ourselves as international. Our ski and snowboard instructors in Val d’Isère hail from far and wide with some of the best French and Italian instructors, as well as some experienced and fully qualified British ski instructors. Rental Republic: Rental Republic have 3 shops in the village and offer top notch well serviced kit for all levels. Intersport: 4 stores in Val d’Isère. Sport 2000: 4 stores in Val d’Isère. SkiSet: Renting ski equipment at Val d’Isère is simple, as you have a wide choice of Skiset stores through out the resort. Misty Fly Ski rental and ski school. Black run Face de Bellevarde into Val d’Isère. La Folie Douce for après ski. The snow park in Val d’Isère – which is amazing. Le Fornet, a hamlet just outside Val d’Isère. Le Chardon Mountain Lodges: 5 star chalets in Val d’Isère. Luxury Chalet Book: Specialise in offering the most luxurious ski chalets in Val d’Isère. Project Ski: Holidays with unbeatable levels of friendly and welcoming service, self-catered basis or flexible catering services. Ultimate Luxury Chalets: Luxury Ski chalets in Val d’Isère. YSE: Chalets with gyms and lifts, saunas and hot tubs, breathtaking views and liveried Land Rovers. Mountain Rooms: A small company that cares about clients, ensuring all properties are well maintained. Beach world, Val d’Isère Centre Aquasportif: To exercise, or simply relax after a day on the slopes. Alone, with the family, as a couple or with a group of friends. Play pool, plus a lengths pool. Sleigh rides: Nursery slope to the left of the Savonette lift. Electronic car track: Children only. Manchet Valley sports area: Equestrian centre, fitness, football, sports shooting, yoga. Val d’Isère ice driving: Karting, motocross, SSV (a side by side vehicle, two seater) and pilotage (navigating) all on snow or ice. Spa World, Val d’Isère Centre Aquasportif: Saunas, steam bath, jacuzzi... the 250-m2 Spa World is devoted to reviving your inner energy. In winter Spa World is open every day from 10am to 9pm. In summer open every day from 11am to 9pm. Late night opening on Thursdays until 10pm. Hotel Aigle des Neiges: Hotel spa which is central to Val village with sauna, steam room, indoor swimming-pool and body treatment centre. Packages can be booked, such as breakfast and a massage. Download the spa and treatment PDF. 10am - 8pm. Le Tsanteleina Hotel: Unwind in the indoor swimming pool, jacuzzi, sauna, hammam or the relaxation area around the pool. There is a dedicated beauty care area with many treatments available. There is also a fitness room. 10am to 8pm. Museum of Val d’Isère: The story of Val. Monday to Thursday - 2pm to 6pm / Friday - 9am to 12:00. Ice skating: Artificial ice skating rink. A host of entertainment, and hot drinks served in the chalet. 4pm - 8pm. Cinema: Find films and times on the Val d’Isère website. Critérium de la Première Neige: Organised by the Club des Sports of Val d’Isère. Men and women’s Alpine Skiing World Cup competition. Beginning to middle of December. Christmas village: End of December. Festi light: Celebration of the new year. Europa cup: Alpine skiing. End of January. Classical music festival: January and March. 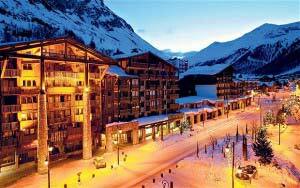 Val d’Isère has plenty of bars, clubs and fine restaurants for all occasions. Cocorico Bar: Located at the foot of Solaise gondola and Face de Bellevarde piste (Stade Olympique), this is the place to meet - for skiers and non-skiers. With a massive outdoor terrace, and a live DJ every afternoon 2pm until 8pm. Doudoune Club: Open from 11pm until 5am. On the Rond Pont des Pistes (centre of Val village). La Folie Douce: At the top of Le Daille lift, on the piste at 2400 metres, this up-tempo bar is the place to party after a day of snowboarding or skiing. Villages des enfants: Recreation centre for 3 to 13 year olds, creche for 6 to 36 month olds. The Bike Park Espace Val d'isere Tignes: With lots of terrain, 5 ski lifts open in the summer months. Mountain Rescue offer Val d’Isère transfers from Geneva, Lyon, Grenoble and Chambéry airports direct to your holiday accommodation in the resort. Transfer time from Geneva to Val d’Isère is just under three hours and roughly the same from Lyon and Grenoble airports. Transfer time from Chambéry to Val d’Isère is just under two hours. When departing Val d’Isère leave around five to five and half hours before your flight. Depending on road conditions. Mountain Rescue offer a private transfer service to and from the closest airports to Val d’Isère. If you are a small group you can choose to share a transfer. This opens up the opportunity to reduce your fair if another small group on similar times is also looking to share. No waiting time will be added to the primary booking without consultation. To book an airport transfer to Val d’Isère use the quick quote on the right hand side of the page to get the price for the transfer. Then complete the transfer request form. Once our office receives your request they will reply swiftly and return an overview of the travel times and a link for a secure on line payment. Clean and comfortable Volkswagen Caravelle minibuses. Smart, uniformed English speaking drivers. Quick and helpful office available 24/7. Child and booster seats (on request). A fully licensed and insured transfer operator. Learn more about our private transfer service in Val d’Isère.